10:39 a.m., June 13, 2013--No matter how identical they are biologically, twins are fundamentally different and unique. In the same way, two cells that originate from a single parent cell may have the same shape and size, yet differ in the level of proteins they carry. Proteins are complex molecules that play a critical role in developing the structure, function, and regulation of the body’s tissues and organs. 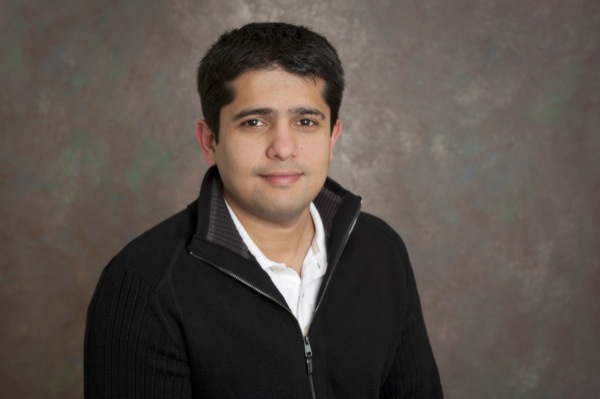 According to Abhyudai Singh, assistant professor of electrical and computer engineering at the University of Delaware, stochastic  or random  differences in protein levels across a cell population can lead individual cells to different fates. For example, when human immunodeficiency virus (HIV) infects a cell the virus either kills the healthy cell and propagates more HIV or the virus becomes dormant and hides inside the cell, only to reappear later at an unpredictable time. It is unclear what drives these cellular decisions but what is known is that the cellular environment is “noisy,” with biomolecules randomly bumping into one another and reacting. This noisy environment, Singh explained, creates stochastic differences in protein levels. The Oak Ridge Associated Universities (ORAU), a consortium of 109 Ph.D.-granting universities, of which UD is a member, recently selected Singh to receive the Ralph E. Powe Junior Faculty Enhancement Award to model how cells make decisions at the molecular level, work that could help scientists comprehend how specific disease processes occur, particularly HIV and other stem cell disorders. Singh is one of 30 winners selected nationwide for the award, which is meant to enrich the research and educational growth of young faculty and facilitate new funding opportunities. He will receive $5,000 in seed funding from ORAU and $5,000 in matching funding from UD to build mathematical models to capture the differing protein levels of various biological systems. He plans to use several nodes on UD’s Mills cluster, a 5,000-processor, high performance computing (HPC) cluster designed for advanced research, to run highly technical simulations of how biochemical processes work and to predict how variations in protein levels arise in otherwise identical cells. An important but complex part of the project, he said, involves incorporating randomness into the model. “It adds a level of complexity, but the model must be inherently random in order to predict the noise or variation you are trying to capture when defining a protein’s functional role,” he said. The work relates directly to Singh’s theoretical doctoral work and his post-doctoral studies, where he worked with Leor Weinberger, professor at the Gladstone Institute of Virology and Immunology, San Francisco, to pinpoint the primary source of gene-expression noise in the HIV system. The key challenge, Singh said, will come when he attempts to integrate experimental data into the mathematical model, particularly data related to HIV. He is already developing relationships with collaborators at University of Pennsylvania Medical School and Johns Hopkins Medical School that he hopes to work with to test the models in the future. Abhyudai Singh is the fourth Powe Award winner on the UD faculty. Previous honorees include Deb Jaisi, assistant professor of plant and soil sciences (2012); Joel Rosenthal, assistant professor of chemistry and biochemistry (2011); and Holly Michael, assistant professor of geological sciences (2010). Abhyudai Singh joined the UD faculty in 2011 as an assistant professor in the Department of Electrical and Computer Engineering and the Biomedical Engineering Program. He is also an affiliated faculty member of the Center for Bioinformatics and Computational Biology. Singh’s research interest lies in how biochemical processes work inside living cells. In particular, he is interested in characterizing gene networks underlying disease systems, specifically pathogenic viruses such as HIV.